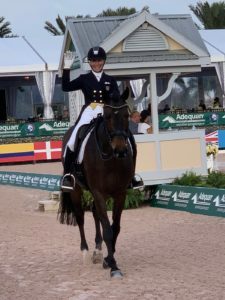 Wellington, Florida (February 4, 2019) – Week 3 of the Adequan® Global Dressage Festival (AGDF) brought more spectacular performances, tough competition and some of the best dressage found anywhere in the world. 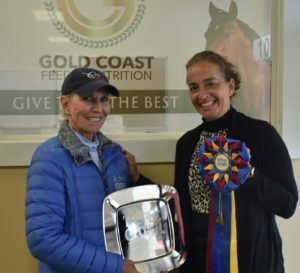 Triple Crown Nutrition is excited to continue to recognize the top, high performance riders who have gathered in Wellington, FL for this world-class international dressage show series. Coming in first in the CDI 1 Prix St Georges was Betsy Steiner, aboard her lovely mare, Swiss W, who is owned by Whitney Bailey. This outstanding blue ribbon performance not only earned the pair a score of 71.681, they were also presented with the Triple Crown Excellence Award. This prestigious prize is given to a horse and rider team that demonstrates exemplary achievement within the equestrian community, as well as showing exceptionally good health and fitness. “She is the most amazing horse,” said Steiner. “She’s all mare and all princess! She is very, very particular, but very correct. She makes me a better thoughtful, thinking rider because she wants me to really take good care of her, and when I do that, she delivers 200%. She is extraordinary!” Steiner goes on to explain how she felt during their winning ride, “It was amazing because she was just so ‘on’ and so focused. It was sort of like time slowed down and I could really think about riding into absolutely every corner, setting her up. She waited for me, was beautiful in my hands, was forward on my leg – I couldn’t ask her for anything more.” This was the first time Swiss rode the CDI in the Global Stadium. “She was so ready to work and so ready to listen,” Steiner describes, “She was just in a great place!” Steiner is based at White Fences in Loxahatchee, Florida during the six-month winter show season, and spends the other six months at her farm in the middle of horse country in Pittstown, New Jersey. When it comes to fulfilling Olympic-caliber horses’ nutritional needs during intense competition, Triple Crown Nutrition knows there is no substitute for supreme quality feeds. The renowned feed company was the first to add prebiotics, probiotics, and organic minerals to horse feed, and continues today to deliver the very best in equine nutrition. Triple Crown’s unwavering devotion to nutritional excellence is not only apparent in its superior feeds, but in its commitment to supporting the dietary needs of horses across many disciplines and multiple training levels. A proud sponsor the 2019 Winter Equestrian Festival and the Adequan® Global Dressage Festival, Triple Crown Nutrition is the official feed sponsor of the U.S. Equestrian Federation. To learn more about Triple Crown feed, please visit the company’s official Facebook page or Instagram @TripleCrownFeed, call (800-451-9916), or visit www.TripleCrownFeed.com.